This fact sheet offers information on workplace raids — including your rights during a raid — plus tips on how to prepare for a raid at your workplace. It also describes how raids are conducted. Remember that everyone has rights during a workplace raid — regardless of their immigration status. A “workplace raid” is when ICE agents come to a workplace to question workers and detain those it believes are in the U.S. unlawfully. Workplace raids can be used to target specific workers as part of an ongoing investigation, or to question all workers who are present. These raids cause fear and panic for employees, particularly those workers who are undocumented. It’s important to remember that everyone has rights during a workplace raid —regardless of their immigration status. How does ICE get into a workplace? ICE agents use a number of strategies to enter a workplace. Sometimes they show up unannounced; other times they ask the employer beforehand. Sometimes ICE may come with a warrant signed by a judge; other times they may force their way in. ICE will also sometimes lie to try to get into a workplace—agents will pretend that they are local police officers, or say that they are looking for a specific person and then question all workers. After Jan. 1, 2018, California law will prohibit anyone from giving agents voluntary consent to enter nonpublic areas of a workplace without a judicial search warrant. And, starting on July 1, 2018, state law will require employers to notify employees about upcoming federal document inspections, and it will prohibit any document reverification that is not required by federal law. What is a workplace audit, and how is it different from a raid? ICE may also conduct a workplace “audit” by requiring an employer to prove that all of its employees are authorized to work in the United States. In this audit, the employer must provide ICE with each employee’s Form I-9 (which is supposed to be filled out by every employee at the beginning of employment). Unlike when it conducts a raid, ICE does not always physically come to a workplace to conduct an audit. Sometimes, however, ICE will come to the workplace to investigate as part of an audit. ICE is supposed to provide the employer a form called a “Notice of Inspection” before conducting an audit, but it sometimes shows up at workplaces unannounced. How have workplace raids changed under the Trump Administration? Workplace raids were common under the Bush administration and in the early years of the Obama presidency, but they became less common in recent years. The Trump administration has said that it will increase workplace enforcement. ICE already has been conducting raids and making arrests at people’s homes and places of work, and even at courthouses. What are my rights during a workplace raid? You have the right to say that you want to speak to an attorney. The government does not provide attorneys to people in immigration proceedings, but you have the right to hire a private attorney or nonprofit lawyer. You do not have to answer questions that ICE asks you, and anything you do say can be used against you. In particular, you should not answer questions about your country of birth, how you came to the United States, or your immigration status. You have the right against unlawful searches by ICE agents and other government officials. ICE agents need a legitimate reason and sometimes a warrant to search you, your personal belongings, your car, and sometimes private work areas (such as employee lockers). You have the right to refuse to sign any documents ICE asks you to sign. ICE might ask you or try to force you to sign documents. You have the right to refuse to sign documents and you should not sign any documents until after you have had the opportunity to review these documents with a lawyer who can help you understand the document and the consequences of signing it. Under most circumstances, you have the right to argue your case before an immigration judge. Note: You may not have the right to appear before a judge if you have certain criminal convictions or a prior removal order. What should I do during a workplace raid? Report the raid to a community hotline. In Alameda County, call ACILEP at 510.241.4011. Or call the national United We Dream hotline at 844-363-1423. What should I NOT do during a workplace raid? How can I prepare for a workplace raid? 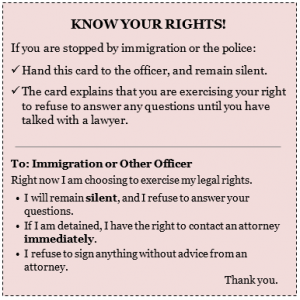 Carry a Know Your Rights card with you to show to immigration officials. DO NOT carry any false documents or foreign identity documents (such as a Mexican Consular Identification Card or “Matrícula”). Note: If you are already represented by an attorney, you should carry multiple signed copies of the G-28 form (“Notice of Entry of Appearance as Attorney”). Know your rights! Become familiar with community groups and organizations, such as nonprofits and unions, that support undocumented workers or offer Know Your Rights trainings. How can I help prepare my family and friends in case I am arrested? Have a discussion with your family about who would care for your children in your absence. Make a plan with the person who would care for your children. Make sure that they have all necessary information, including emergency contact information and information about your child’s medical needs. Make sure that your children’s schools have an updated list of people authorized to pick up your children, including the person who would care for your children in your absence. Make a plan for who you or your family members would contact in the event of a raid or if you were detained. Tell your family members how to find you if you are arrested by ICE. If you have an “A-number,” make sure your family members know it. The A-number is how ICE keeps track of you in its system. This file should include: identity documents, birth certificates, your A-number (alien registration number) and immigration documents if you have them, and emergency contact information. Here is a list of other important documents to include, from Immigrant Legal Resource Center. What are my rights as an undocumented worker? In California, undocumented workers essentially have the same employment rights as all other workers. It is illegal for an employer to discriminate against a worker based on her national origin, including her ancestry, her accent, or the language that she speaks. It is also illegal for an employer to retaliate against a worker for exercising her rights. In other words, if a worker reports or complains about discrimination, wage theft, safety issues, or other workplace violations, it is unlawful for her employer to take actions against her, including calling or threatening to call ICE. Employers who retaliate against their workers by threatening to call ICE could also be charged with criminal extortion. When you start a new job, your employer will ask you to fill out a Form I-9, which the federal government uses to verify your identity and work authorization. When you fill out the Form I-9, your employer will also ask you to provide certain identity documents. Employers are prohibited from rejecting documents that appear valid, or insisting on additional documents beyond what is required by the Form I-9. An employer cannot require employees it thinks are “foreign” to produce certain documents, such as a green card. Employees are also allowed to choose which documents they provide from the Form I-9 Lists of Acceptable Documents. Once you fill out the I-9 and provide the required identity documents, your employer is generally not allowed to ask you again about work authorization or immigration status. Employers can only ask to “re-verify” you (or ask you for proof of your work authorization) under certain specific circumstances: if ICE audits your employer, if your work authorization expires, or if the employer is re-verifying every worker’s documentation. In other words, an employer cannot ask only certain workers to re-verify, and cannot routinely ask workers about immigration status.